‘Ghost history’ can be very fickle. Unlike ‘real history’ - which needs to be based on actual historical events to be considered factual - ghost stories need nothing more than to be told before they become part of local lore. These stories can spread quickly and widely, and often get distorted in the retelling. There are many claims of recent personal experiences with the paranormal at a range of homes around Heywood, but this article is more concerned with the older stories that have been passed down generations of Heywoodites and become part of local folklore. The folklore of boggarts was especially widespread in northern England, with one of the more famous being the ‘Clegg Ho’ Boggart’, in nearby Littleborough. Boggart Hole Clough, in Blackley, Manchester, is supposedly named after one of these beings, as is Boggart Lane in Sowerby Bridge, Yorkshire. Boggarts were a kind of malicious fairy which played pranks around the house or farm. They could live under bridges, on dangerous bends on roadways, and also up chimneys. The kind of mischief they got up to included turning milk sour, making dogs go lame, pulling bedsheets off beds, and pulling the ears of unsuspecting victims. In general, if anything bad happened or was out of place, it could be blamed on a boggart. They were said to become particularly destructive if they were given a name. Ways of keeping boggarts out of the house included hanging a horseshoe over the door, or leaving a pile of salt outside a bedroom. Superstitions about boggarts persisted, especially in the isolated rural communities on the fringes of towns like Heywood where change was slow to come and the nights were black, slow and silent. Most relied on the spoken word, not being able to read or write, and subject matter was a bit more limited than it is today, so stories were passed down generations and took firm root. Edwin Waugh, a 19th-century writer from Rochdale, was a frequent visitor to Heywood and was well aware of the ways of the people. His 1850s book ‘Lancashire Sketches’ contains a chapter about the ‘Gristlehurst Boggart’ (see here for more about that). He described how quiet corners of the town were still in the thrall of centuries-old superstitions and beliefs. Heywood has its own cast of old-time ghosts, although the origins of some of them have been lost in time. Some of them conform with established archetypes found elsewhere. These include the ‘Headless Horseman’ and ‘Grey Lady’ of Hopwood Woods, similar to ghosts no doubt featured in thousands of other local stories around Britain. There are also tales of another (or perhaps the same) Headless Horseman riding down Chadwick Lane, to the north of Hopwood Woods. The supposed origin of these ghosts is unclear, and belief in them tends to be stronger among children. There was a ‘White Lady’ up Ashworth Valley, near Windy Cliff alongside the Cheesden Brook (a cliff also known colloquially as ‘Devil's Drop’ and ‘Dead Man’s Drop’). This is a dark, romantic setting well suited to a ghost story, with its deep valleys, thick woods, and farmhouse and moorland background. It is probably no coincidence that there is a scout camp very near this spot, home to decades of the telling of campfire ghost stories. In one version of events, she was supposed to be the ghost of a woman who had died after accidentally riding her horse off the cliff, and sometimes her ghost could be seen still galloping along the top of the cliff on horseback. Another version has her wandering the valley searching for her dead lover, because she had arranged to meet him there one night, but a thick fog descended and he fell off the cliff. In her grief, she committed suicide by jumping after him. 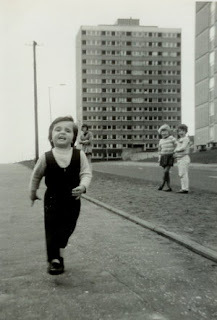 Heywood children during the 1970s perceived this White Lady to be particularly scary, a feeling probably enhanced by scout tales, and the lingering traces of a popular medieval superstition that the appearance of a White Lady foretold the imminent death of a family member. 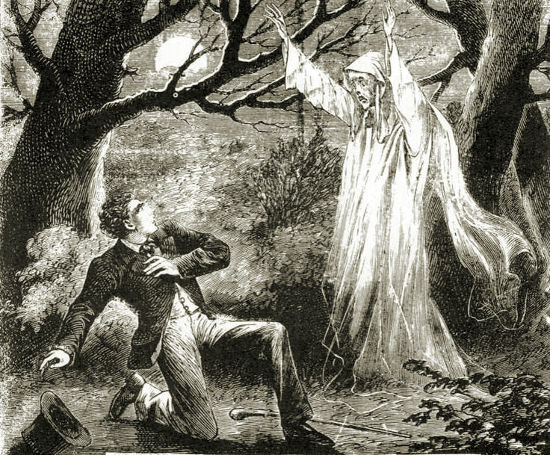 The White Lady is a very widespread ghost type in Britain. 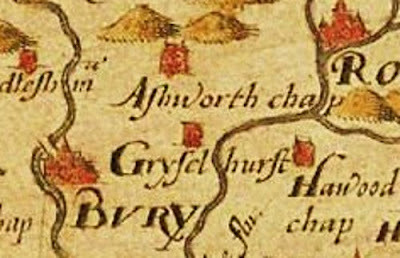 “Robert Holt nephew of Sir Thomas was the priest at Ashworth and he had fallen in love with Margaret Scolfeld a local woman. As priests couldn't marry they kept it secret. Thomas Holt, his twin brother who had had his living as a parish priest of London taken from him for nonconformity, said that priests could marry under new laws. Margaret rejected the advances made by Miles Plowman as she was loyal to her first love Robert. Robert Holt stopped Miles Plowman when he attempted to kiss Margaret against her will. It is always important to do a bit of fact-checking with the alleged historical events associated with some ghost stories. In this case, no dates are given for these events, although Robert Holt is not featured on a list of vicars who have served at St James’ since 1614 so this murder would have to predate that year (the church has been in existence since at least 1514). However, a detailed timeline of the Holt family history from that (or any other) time contains no mention of any such incident. 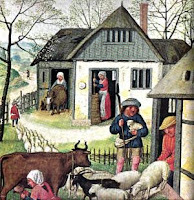 It seems quite possible that this spectacular tale is an urban (or rural) myth. The chapel at Ashworth was depicted in Christopher Saxton's map of the area from the 1570s. St James' Chapel, possibly 1900s. 'This grove so shut out the view, and overhung each side of the way, that the walk between looked very lonely after dark; and country folk, who had been loitering late over their ale, in Heywood, began, when they reach "Th' Lung Nursery," to toot about from side to side, with timid glances, and stare with fear at every fitful rustle of the trees. Even if two were in company, they hutched closer together as they approached this spot, and began to be troubled with vivid remembrances of manifold past transgressions, and to make internal resolutions thenceforth to "Fear God, an' keep th' co'sey," if they could only manage to "hit th' gate" this once, and get safely through the nursery, and by the water-stead in Hooly Clough, where "Yewood Ho' Boggart comes a-suppin' i' th' dhyed time o'th' neet." (Waugh, Lancashire Sketches, p. 197). A more modern ‘ghost’ is the ‘Fireman’s Foot’ at Crimble Mill. The story goes that there was a fire at the mill early in the 20th century and a fireman had to get out of a window about four storeys up, but his foot got stuck and came off, and you could still see the ‘ghost’ - or at least an eerie imprint - of the fireman’s foot in the window there. Another version has him falling to his death. While this story was popular among children, it turned out that people were looking at different marks on the building which they thought was supposed to be the mark of the foot. An adult appraisal of the ‘foot’ revealed it to be either a smudge of blue paint on a glass pane or a dark stain on a window ledge. With the mill currently in a state of disrepair and most of the windows smashed, it is likely the Fireman’s Foot will disappear from history. Another ghost story that seems to have changed over time is that of ‘Ernie Potter’ of the Roach Mill, Back o’th’ Moss. The origins of this ghost are unclear, but children used to nervously look for the ghost during the 1970s when the mill was semi-derelict. However, it seems to have been known as ‘Arthur Potter’ or something similar by earlier generations dating back to at least the 1940s. The mill is now gone, and presumably the spirit of Potter has gone with it. A tale in Heywood Living Memories ('The Mystery of the Dell', Issue 41, 2000) has two young people on Siddal Moor one summer evening in 1935 witnessing a strange figure pass through a fence. He is described as wearing a long coat and cape, a wide-brimmed black hat and a 'small crown' as worn by 'the clergy in France'. However, the author was anonymous and it is unclear from the style of writing whether the story is meant to be fiction or a genuine recollection. There are of course other incidents involving personal experiences around Heywood, and some of these can be found on the ‘Remembering Heywood’ Facebook page. Some of these stories involve pubs, including a ‘strange figure’ caught on CCTV in the ‘Our House’ pub one night, and moving glasses in the ‘Navigation’. 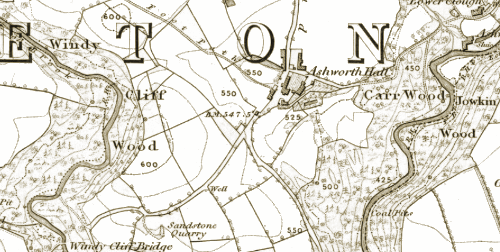 'Owd Betts' near Knowl Hill is allegedly haunted by the ghost of old Betty herself (died 1893), although some accounts of this need to be taken with a grain of salt. There have been suggestion of spooky goings-on the 'Queen Anne Inn' - a place that is often incorrectly associated with executions. There would no doubt be other pubs with claims to be haunted, but there is always the possibility that some 'pub ghost' stories are the result of owners seeking publicity for their venue. Another place claimed to be haunted is a house near Barley Hall Street that allegedly used to be a pub and then undertakers. Someone was supposedly shot to death there. This pub could have been the ‘Dog & Partridge’, which opened at Captain Fold in 1824, and would provide a rare example of a story that has at least a small element of historical fact behind it. James Duckworth, a labourer, was found beaten nearly to death after drinking at the pub one night in 1847. He was carried back to the Dog and Partridge, where he died. There was only enough evidence to bring a charge of manslaughter against the accused killers. Various homes associated with allegedly supernatural experiences include one house next to the old St Luke’s school; a new house on Cranmer Court; the ‘old gatehouse’ on Nellie Street; a house near the corner of Bury New Road and Heady Hill Road; Hornby Street; Miller, Street; Leopold Street, Hopwood; Rochdale Road East; one on Bury Old Road; the end of Hill Street; and Harefield Hall. One large house near Newhouse Road was also reputed to be haunted, with one story appearing in the Heywood Advertiser telling of a mirror being somehow cut into the shape of a perfume bottle, by a ghost. There would of course be many more stories. Some would be the result of direct experience and sincerely believed, but others might be the result of childhood imagination, hearsay, or have an otherwise rational explanation. Most adults can recall the time when they were children and how excitedly and unquestioningly such stories were believed and shared around. It is likely that the stereotypical 'Headless Horseman' stories are a product of such a process. The tradition of scouts telling ghost stories around the campfire at Ashworth Valley might also have created a few ghosts of the 'White Lady' variety. It is important to remember two things here: Firstly - many 'paranormal experiences' can have a rational scientific explanation that is not always obvious. Second - historical events in stories about ghosts may be inaccurate or never happened at all. After that, there is always a third thing to keep in mind... it might be a ghost. Readers are welcome to leave comments on this subject below, or on the 'Heywood in History' Facebook page. 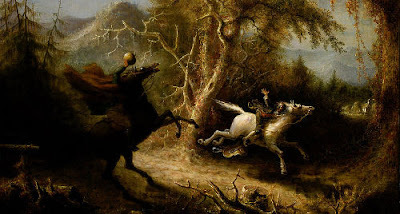 'The Headless Horseman Pursuing Ichabod Crane', painting by John Quidor (1858). Edwin Waugh and the Gristlehurst Boggart: In 1855 local writer Edwin Waugh heard all about a noted local ghost. Jemmy Whitehat: A 'Witch-Doctor' in Heywood? : A look at stories and beliefs about witches in Lancashire and the town of Heywood. The Gristlehurst Boggart Revisited: Another look at the Gristlehurst Boggart from the 1890s. The Devil and the Monkey Puzzle Tree: Learn about the local superstitions and history of the Monkey Puzzle trees in the Lancastrian town of Heywood. Charles Hardwick, Traditions, Superstitions and Folklore, chiefly Lancashire and the north of England: their affinity to others in widely-distributed localities; their eastern origin and mythical significance, 1872. John Harland, Lancashire Folklore: Illustrative of the superstitious beliefs and practices, local customs and usages of the people of the county Palatine, 1867. John Harland & T.T. Wilkinson, Lancashire Legends, traditions, pageants, sports, etc, London, 1873. Edwin Waugh, Sketches of Lancashire Life and Localities, London, Simpkin, Marshall & Co., 1855.